Add the Rogues Crossover Pack to any DC Comics Deck-Building Game to play as The Flash's worst enemies, complete with a new "Teamwork" mechanic so they can help each other stop the Scarlet Speedster! 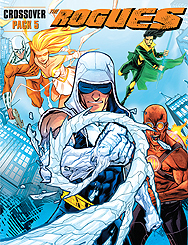 Captain Cold, Mirror Master, Heatwave, Golden Glider, Weather Wizard, and Trickster! All-new Super Hero, Equipment, Villain, Hero, Super Power, and Location cards!